Take time for yourself. Take a few minutes every day to sit quietly with no distractions, breathing deeply and calming your thoughts. We are creatures of habit. We, by design, filter out thousands of bits of information throughout the day and focus only on a few. Feelings that are important can be filtered but continue to play out in the background. Things can be forgotten or overlooked. Sitting quietly for a few minutes helps to center yourself and have the whirlwind slow down long enough for clarity. Taking a day away from everything, walking or sitting in nature can be incredibly rejuvenating. No agendas or plans, just you back in your natural state. If possible, doing this for a few hours once per week can bring an awareness to life that nothing else can. 1. What's your most important emotion right now? Is it one that is distressing and needs some kind of remedy, either from yourself or from people who surround you? 2. What have you overlooked, put off, or cancelled that was important to you? 3. Are all of your most important relationships in a place of peace, or are there some words that need to be said to keep communication lines open? 4. Do you need a change in some aspect of your life? Why are you delaying the change if you are? Are you being held back by rational or irrational fears? Go through some best case and worst case scenarios on choices and outcomes. We take time once or more per week to get groceries for our physical bodies. We take time once a day to shower to maintain our physical bodies. We take time a few times per day to eat to nourish our physical bodies. It's just as important to plan for, clean, and nourish our minds as well. The mind is the control center for the entire body, and if it isn't cared for, the whole body suffers. 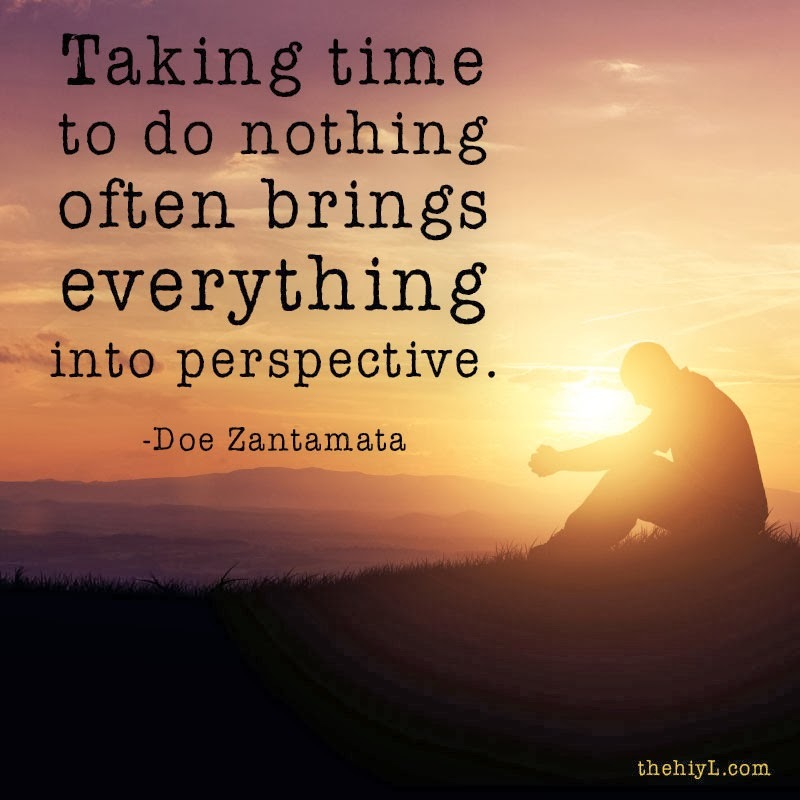 Taking time to do nothing often brings everything into perspective. Make sure to make time to do nothing.